Last Friday night we went on an outing with the grandchildren. The Saanich Historical Society and the Model Train Association share a space not too far away from us. We managed to put three car seats into the back of the SUV, buckled everyone in and off we went. There are four trains that trundle along a track, taking passengers through the woods, over and under bridges, into tunnels, and along a pond. Children and adults alike are enchanted by the ride. The photos don't show well because of the dark. Above is the engine of one train complete with Christmas tree. Ours didn't have a tree. Grandpa and Mr. F waiting patiently in line. The train conductor handed out peppermint striped candies which helped the wait pass more quickly. Here's a photo of a bridge with the lights reflected in the water. Mr. F perched in front of me on the ride and every time we went over a bridge he would clap his hands and say, "oooh!" So sweet. After the ride we wandered through the village. Above is the tiny church, complete with a manger scene. We arrived home a bit chilled and enjoyed hot chocolate and cookies before bed. The two Little Misses are very adept with a mouse and played the ornament smashing game on the Jacquie Lawson Advent Calendar. It was a sleepover night and everyone went down well, or so I thought. There was no noise from Mr. F., in his own room, but after an hour or more, I thought I heard something from the girls' room and upstairs I went. There they were, two little tousle-haired darlings, on one bed, giggling like teenagers and taking turns throwing a small blanket over each other's head. Cousins having fun. It took me back to some of the fun times I had with my own cousins. I settled them down once again and off they went to dreamland - until 6:22 am! Frosty the Snowman on Netflix kept them happy until Nana made breakfast - sausages and snowman pancakes and fruit. All three of them are in constant motion and the only decent photos are these, taken while they were in their chairs at dinner before we left for the trains. I went to sleep that night with a heart full of contentment and joy. The house felt full, too, with three little people. Just as it used to be. Are you planning any special outings during the Christmas season? Your grandchildren are so incredibly cute and they look already much bigger than when I visited your blog for the first times! Wishing beautiful December days to all! Oh the sweetness of young children and this Christmas season. :-) Mine are teens now, but I have a lot of warm memories. Whoever got that final third car seat in the back probably needed an award too. This is what the season is all about, creating wonderful memories for the children. And it looks like you have 3 very well behaved grand children as well. Christmas festivities are all about children and family get togethers, You certainly had fun with your little ones. I miss those sort of activities now that our grand children here in France are grown up. We do have younger ones in Denmark but we did our visit earlier in November, so won't be seeing them for Christmas.this year. Lovely post. Oh so sweet. Glad your heart is filled with these moments with your grands. Sounds like a very enchanting evening with the little grands :) We used to have a miniature village here in town and they put on a magical Christmas display each year. The miniature town had a proper Christmas parade running through the tiny houses. Then there were giant Christmas cards to wander around, all lit up and sparkling and lots of Christmas carols playing. There were live animals for the manger scene, a toy shop window with old fashioned toys ... well, the list goes on and on. Sadly, the family owned business has closed down now, but I'm so glad my kids were able to enjoy those special outings during their younger days. How fun! I'm sure they kids loved it. We are supposed to take ours caroling tomorrow night but at the moment they have caught the current bug going around so we shall have to see. Now they are all grown up! What lovely memories we grandparents can create. Your sweet grandkids are getting so big!! I sure love having our nephews from down the lane in our house too!! Lots of laughter...hot chocolate at the island, with some cookies....they are good medicine for sure!! We have a busy month of December with potlucks, and games nights, Kings Kids concert, Christmas carolling and I will have to put doing a twinkle tour on my list too!! Have a great day! No, but what joy with your outing. Children make a house a home for sure! They are all adorable. I have not seen your grandson for a while. He has grown so! Now I must go smash some ornaments! Oh Lorrie, it looks like you all had a blast together-what fun!! They are all such cuties. Is this all of your g'children? Oh how special, special! what fun and what memories. No wonder your heart sighs with joy and contentment. Just as it should be. I love watching my grandchildren playing together as cousins. . . such fun! What a delightful time for everyone!! I am smiling at Mr. F's "oooh"s and the not-sleeping girls! Such sweet moments! Awwww!! We go every year too, thanks for reminding me Lorrie. It looks like you had a lovely time!! We went to see the Christmas lights, our annual tradition, with my son, dil and granddaughter, and my parents. We had fun, then got our traditional after lights donut! How lovely, Lorrie, to have spent such a fun-filled day and night with your adorable grands! Frosty used to do the trick with us, too, as kids, and still does, I might add, as adults! Love that (snow)man! Lucky grandma and grandpa and lucky little ones to have you two to love them so. 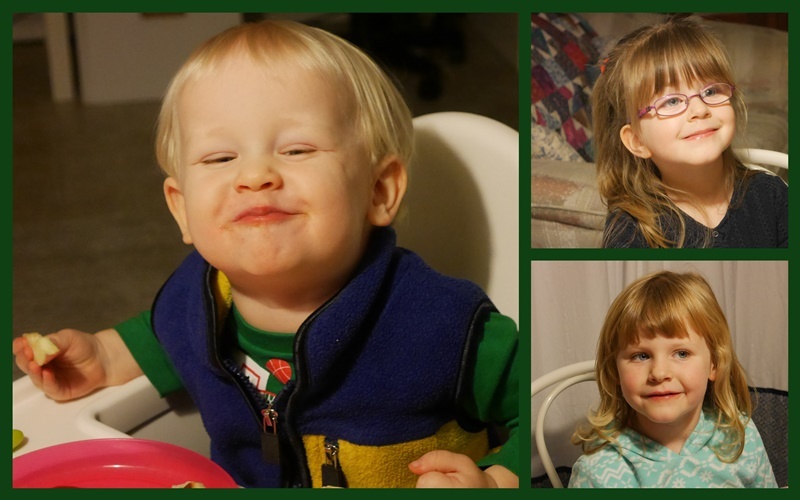 Grandkids make the holidays so much fun. We have lots of family time planned during the season. Tomorrow our middle grandson and I are going to edit pictures he took of his dog and cat and we are going to make calendars as gifts for everyone. He is 11 and is getting pretty good with the camera. I miss having the little ones at christmas - but the bigger ones are just as much fun. You trip on the train looks wonderful!!! What treasured memories you've made with your hubby, Lorrie! I loved hearing about the giggling of the girls and seeing those happy, smiling faces. Oh what fun for grand kids and grand parents. I love all the things there are to do with the little ones. I will post tomorrow our Christmas event day on Saturday with our little guy.